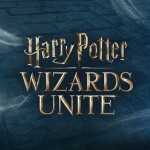 All year LEGO has be rolling out new Harry Potter and Fantastic Beasts brick sets, many of which are now available on their official Wizarding World mini-site. 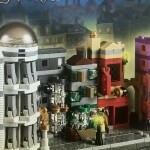 Most recently the toy brick company unveiled its second largest set in history, the 6020 piece Hogwarts Castle, complete with the four Hogwarts Founders and a Chamber of Secrets, among so many other spellbinding details. 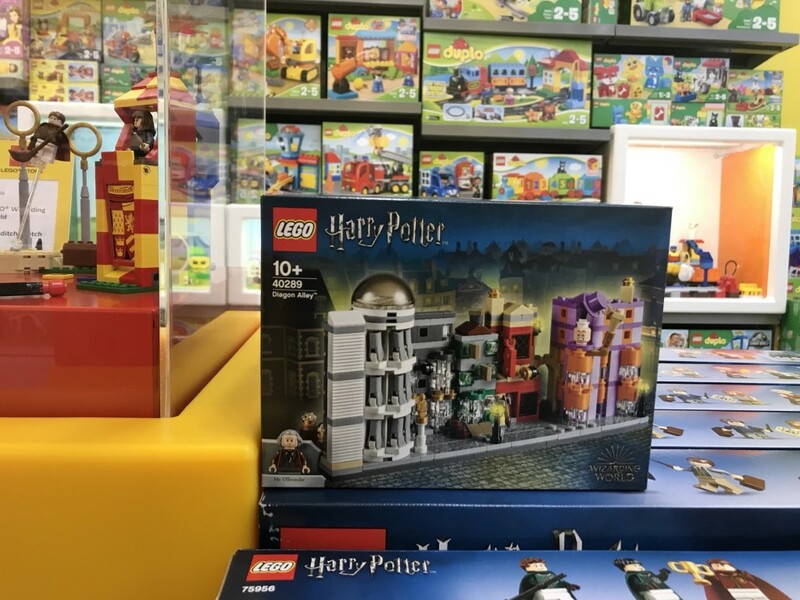 And as if that wasn’t enough magic for Potter LEGO fans, a Diagon Alley set has been found in a certified LEGO store in Slovenia. 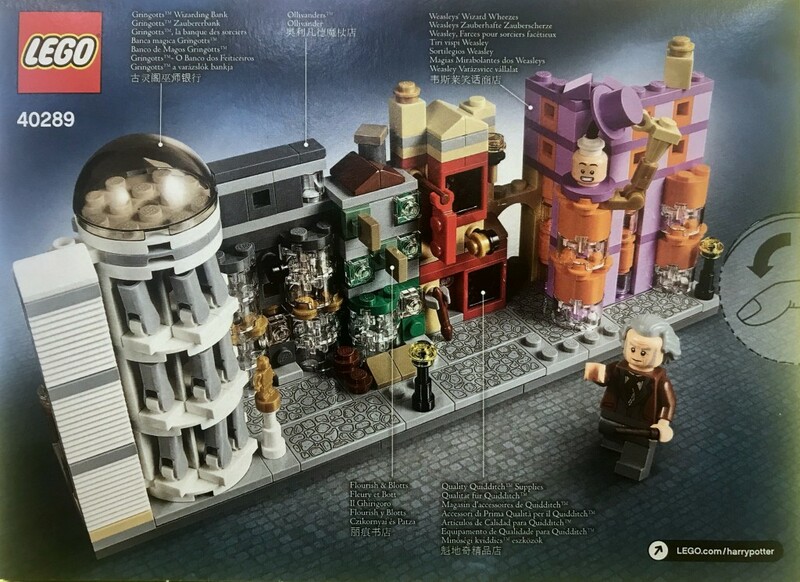 According to brick fan site Brick Set who spotted this gem, the number of pieces doesn’t appear on the box, so the size of the set, as well as the price, is still a mystery, but details of the contests are listed on the back side. 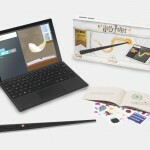 To our delight, the set includes a miniature dome-topped Gringotts, Flourish and Blotts, Quality Quidditch Supplies, Weasleys Wizard Wheezes in its familiar orange and purple, and Ollivanders Wand Shop with a Mr. Ollivander mini-figure. 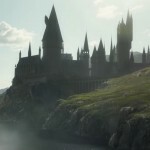 The only magical venue were missing is, of course, The Leaky Cauldron! 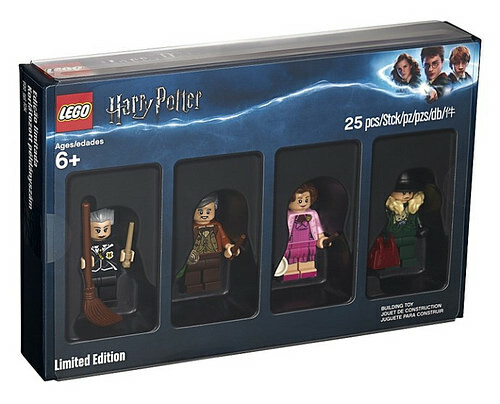 In other brick building news, according to a second LEGO fan site Brick Fanatics, this new LEGO Bricktober set containing Madam Hooch, Horace Slughorn, Dolores Umbridge and Professor Snape Boggart will be available August 27-September 2 exclusively at Barnes and Noble. Interestingly, the Diagon Alley set 40289 isn’t displayed on the LEGO site, but keep your Extendable Ears ready for the announcement, and you can be sure more Fantastic Beasts sets are on their way as we get closer to the November 16 release of Crimes of Grindlewald!